The British Mod style emerged from a desire among British youth to break away from the stiffness of the 50’s and uncouth look of the teddy-boys, and to emulate the more stylish Italian, French and, latterly, American fashions. In the same way the mod revival of the late 70’s/early 80's was a reaction to the dreadful styles of the 70’s and, although the revival was partially born out of punk, the lack of direction offered by that movement. From the start the mod movement also went hand in hand with the emergence of modern jazz and throughout has been influenced by Black music and style. The original and enduring mod style is a slim-fitting dark coloured suit, worn with a lighter coloured shirt and thin, dark tie, along with a pair of dark shoes. Of course this is a style that can be worn by many a person walking along the street but the beauty is in the details. 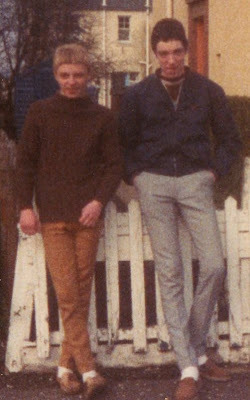 Mods usually prefer a two-tonic coloured suit, made of a light material and fronted by three buttons (with the bottom button being left undone). The jacket has a breast pocket which can be adorned with a handkerchief in a variety of styles. The shirt is usually a button down with the most popular make being the ‘Ben Sherman’ incorporating a small button at the back of the collar. This style was reciprocated by mods of the early 80’s with the only modification being that the trousers had became narrower and were often short enough to show the dreaded white socks that were initially popular at the time. 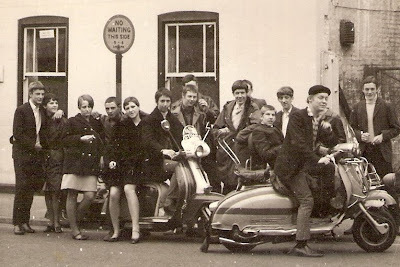 As Mod increased in popularity in the 60’s a more casual style of dress was introduced. 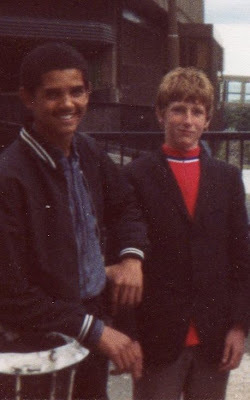 Indispensable to this look were levi jeans (with short 1 inch turn ups), fred perry tops and desert boots. 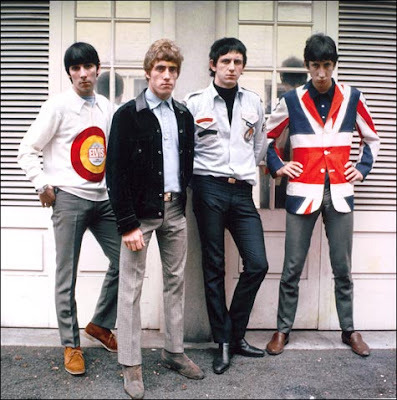 Italian and French fashion remained an influence with tight-fitting shirts, striped t-shirts, cycling tops and hipster trousers all becoming part of the mod look. The mid 60’s Mod style was influenced by pop art which took everyday items out of their normal context and made them into something entirely stylistic. This was most vibrantly expressed by The Who with their symbolic use of arrows, Union Jack jackets and RAF target emblems. The influence of pop art continued during the mod revival years and jackets and parkas were often adorned with badges and patches by the early mod revivalists - although this came to be seen as passé. Scooter art also came to the fore during the mod revival. In the wake of the horror that was 80's fashion, the Mod style retains as much appeal in the 00's as it did in the 60's and High Street fashion is highly influenced by the mod look - even the old mod fish-tail parka has become part of mainstream fashion. Despite that, Mod remains, in essence, an underground movement and mods from all different age groups and many different countries keep the scene buzzing with their own ideas and interpretation of what is THE MOD STYLE.